The pdf2bricscad plug-in installs within BricsCAD and enables user to open and edit PDF drawings. Volume discounts are automatically calculated as products are added to cart. Use pdf2bricscad to transform vector PDF files into editable CAD drawings and save hours of redraw time. Just select your PDF file, an accurate and editable drawing will open within BricsCAD. pdf2bricscad is ideal for converting computer-generated CAD drawings, floor-plans, network diagrams and organization charts. It extracts editable CAD entities, objects and text from any computer-generated PDF file. 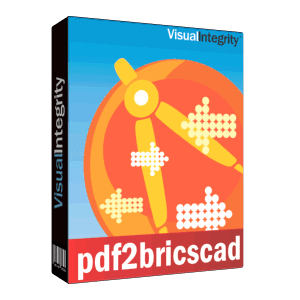 pdf2bricscad is available as a plug-in for BricsCAD on Microsoft Windows systems. Requires and Autodesk program and computer-generated PDF files. Not for scanned or hand-drawings.